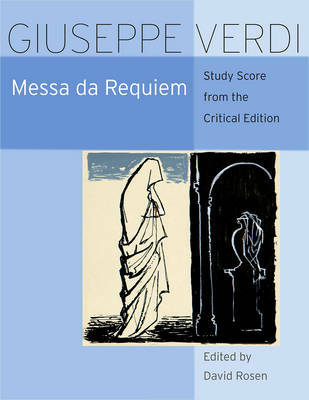 This edition of Messa da Requiem is based on Verdi's autograph score and other authentic sources. The appendixes include two pieces from the compositional history of the Requiem: an early version of the Libera me, composed in 1869 as part of a collaborative work planned as a memorial to Rossini; and the Liber scriptus, which in the original score of the Manzoni memorial Requiem was composed as a fugue in G minor. The introduction to the score discusses the work's genesis, instrumentation, and problems of notation, while the critical commentary discusses the editorial decisions and traces the complex compositional history of the Requiem. When the University of Chicago Press and Casa Ricordi came out with Rigoletto, the first publication of the Works of Giuseppe Verdi, a new standard was set. Since then I have been encouraging conductors, singers, coaches, and stage directors to use these critical editions when preparing a Verdi opera. With the publication of the study scores, it is now easier to work from and travel with the music. These are the best scores from which to learn Verdi s music on any level and the only valid material for interpreting Verdi s music today. --Victor DeRenzi, artistic director and principal conductor, Sarasota Opera"